The Jeep Renegade looks to turn heads at Reedman Toll Chrysler Dodge Jeep RAM's showroom for its 2016 line of SUV's. 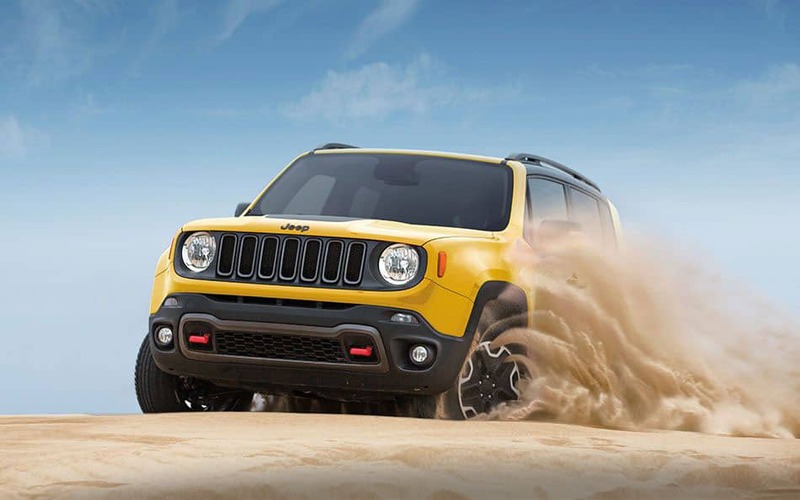 The Renegade offers up to four models to choose from such as the Sport, the Latitude, the Limited and the Trailhawk, all come with different features for each model. The Renegade is a four door SUV that works amazing outdoors with its state of the art off-road capabilities, and excellent exterior and interior features. The 2016 Renegade is looking to be the top of its class and the best with its Trail Rated Tough Approval. The Renegade offers two award winning engines and transmissions for under its hood. One of the engines offered is the 2.4-Liter Tigershark I4 engine; a front wheel drive system with a four cylinder placed, a nine-speed transmission and a single overhead cam (SOHC), the engine gives plenty of power with 180 horsepower at 6,400 RPM and torque pressure of 175 ft-lbs at 3,900 RPM. With its towing capacity the SUV can pull a max of 2,000lbs. For its fuel usage, the Renegade offers the best EPA-rated fuel economy with 22-city/ 31-highway MPG; while on a 12.7-gallon tank of fuel can offer a range of 280-city/394-highway total miles. The SUV offers a four-wheel independent suspension system with front and rear stabilizer bars placed on all four corners. And with its four-by-four best-in-class capability, the Renegade leaves no room for imitators for great off-roading on the great outdoors. Jeep offers plenty of exterior and interior features to its line of models for 2016. One of the models featured is the 2016 Jeep Renegade Sport; for its exterior, the model offers its standard seven-frame grille with Halogen headlamps attached on both sides, 16-inch x 6.5-inch styled steel wheels, deep tinted glass windows/windshields, and My-Sky which is an open air dual panel sunroof that can be retracted and removed completely for its open air drive. The interior of the Sport Model comes with five-passenger cloth seating with its 60/40-split fold option for second row seating that can give plenty of cargo space for storage. Rugged, but smooth side panels are placed to give it that almost luxurious feel to the SUV, and for its entertainment system, the Uconnet Access System offers plenty with a 5-inch touchscreen display, 4 speakers, a media hub for USB and Aux usage, an integrated Bluetooth system, and a Uconnect 5.0 AM/FM Bluetooth feature. What are some life-saving driving tips? Head to our Life-Saving Driving Tips section to find out more. Click for our life-saving driving tips! What other Jeep brand models do you currently have in stock? 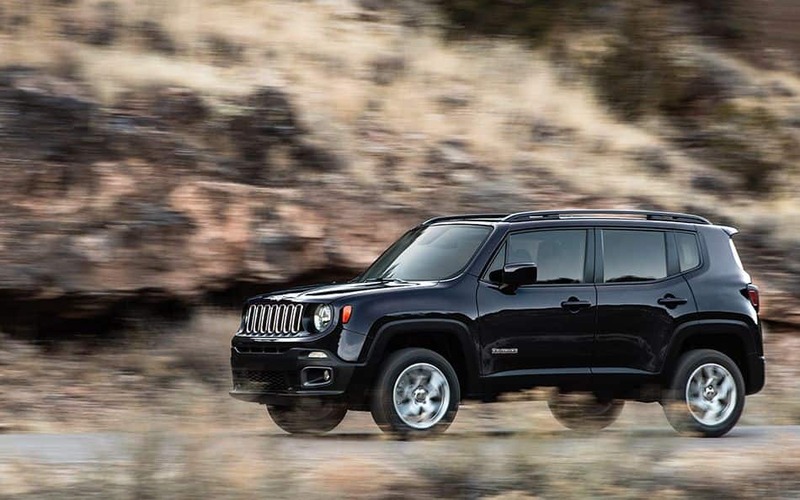 The Renegade knows that safety and security comes first with its drivers, so that's why the SUV offers up to 70 safety and security features to give any driver peace of mind when going off road. 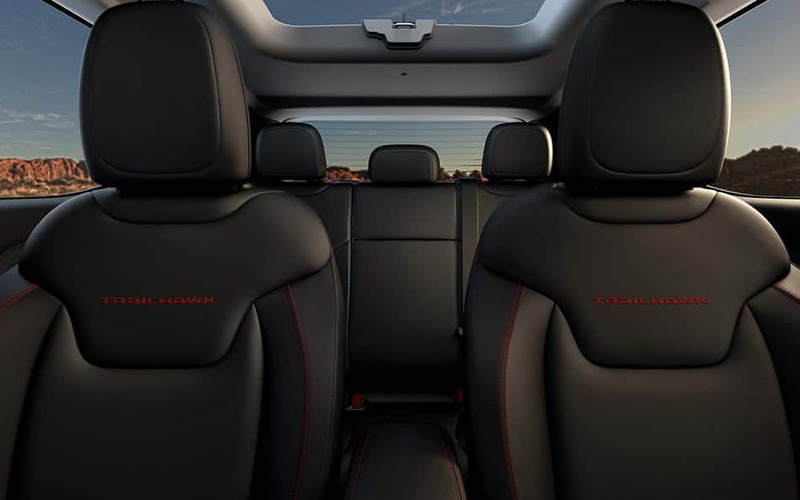 The SUV offers its standard airbags, along with Parkview rear backup camera, blind spot monitoring, lane-sense departure warning, rear cross-path detection, electronic roll mitigation, hill-start assist and plenty of other safety and security features. The Jeep Renegade is looking to be the top of its class in the SUV category. Not just for the family outings, but for the best off-road experiences with its amazing traction control and its four-by-four that can almost go anywhere. The 2016 Jeep Renegade is the SUV you'll want to drive in 2016.